1.High Quality: The brackets are made with good craftsmanship and come with high-quality stainless steel materials; rust-resistant and durable, can serve for a longer time. 2.Save Space Bracket: Stalling the angle bracket in the wall to hang something which can make the mess in orderly; it can also save space in a limited room and makes the house look tidier and give you a happy feeling. 3.Strong Loading Capacity: The thicken angle bracket can provide a more strong loading capacity, more durable; Both sides are fixed with holes, it becomes solid and powerful and don't worry the carrying falling off. 4.Countersunk Screw Hole: Countersunk mounting screw holes design makes the screws not appearing outside, protecting the quality of screws and making the appearance more beautiful, better effect of installation; curved design makes the edge smooth and it can also protect your hand from scratch. 5.Easy Installation: Widely used in home and factory areas. Specially designed with a 90 degrees right angle, is an important fastener to make furniture parts stay firm. 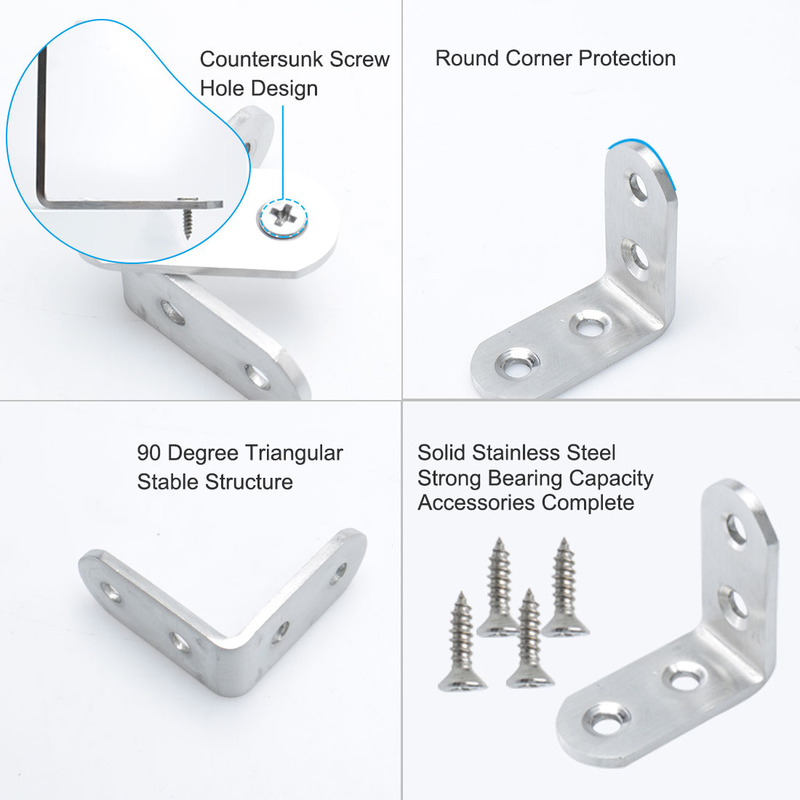 6.Application: This kind of L bracket can be used to build a frame or serve as a corner connected like a wooden table, floating shelf, wooden bed, window, shelf, furniture, fastening chair, dressing table repair, cabinet fixed, dining table assembly, etc. 1.Variability of 1-2mm is possible due to the measurement process. 2.Due to the screen setting difference, the color of the item may be slightly different from the pictures.